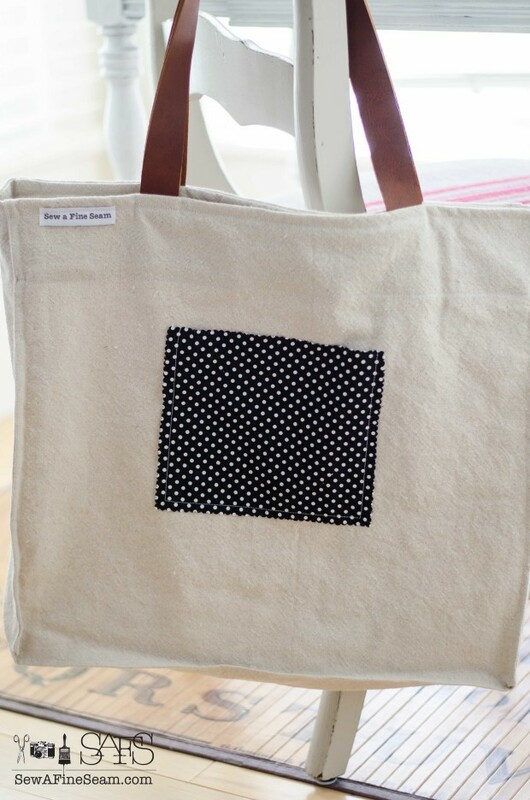 Sew a Fine Seam has some new designs and I’m finally posting them here to show you! I’m really excited about them and I hope you love them too. And now, let me introduce you to my new pillows and handbags. 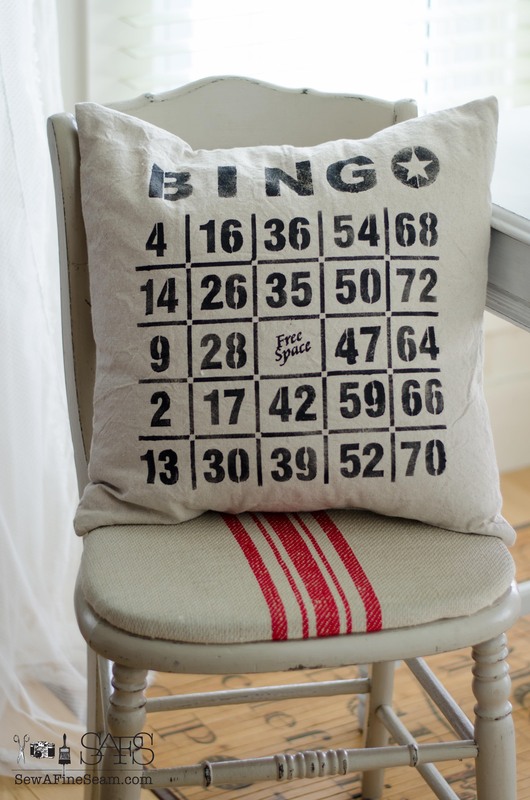 First up is this cool, cute Bingo design! I love this. Sized at 20×20 and filled with a feather form this is the perfect throw pillow to add to your decor. This could also be done in grey or a fun color to make it pop. Just ask me and I’ll let you know if I have the color you want. 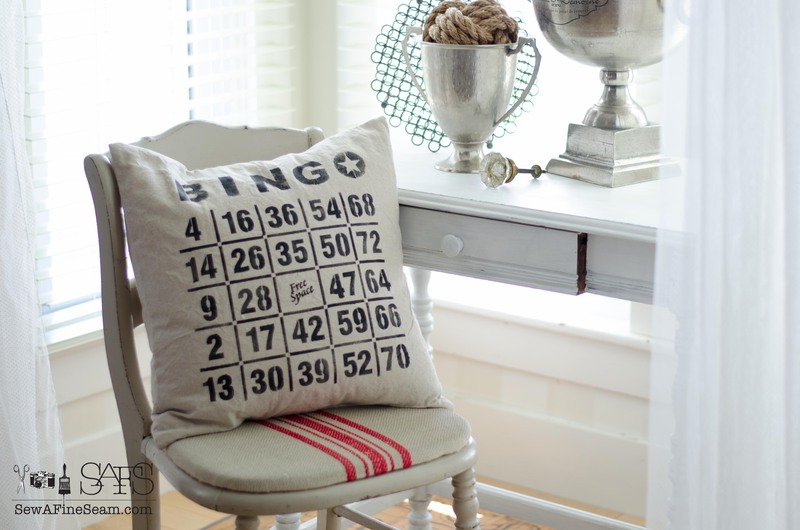 The Bingo Pillow can be purchased in the Shop! Feeling nostalgic? Route 66. 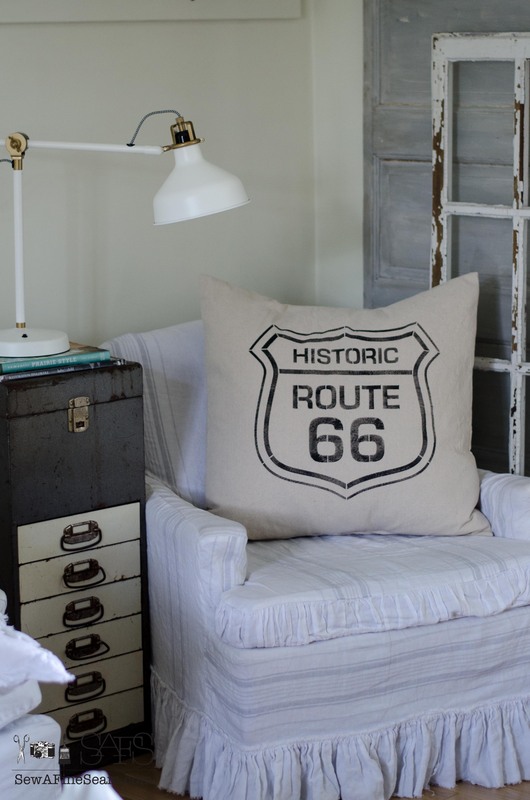 This pillow is huge – 26×26 it’s perfect for those oversized couches in game/tv rooms or for floor pillows when extra seating is needed for those overnight slumber parties your kids have and everyone gathers for the movie of the night. These look good on a bed too. This one can be sized down to the 20×20 size too. 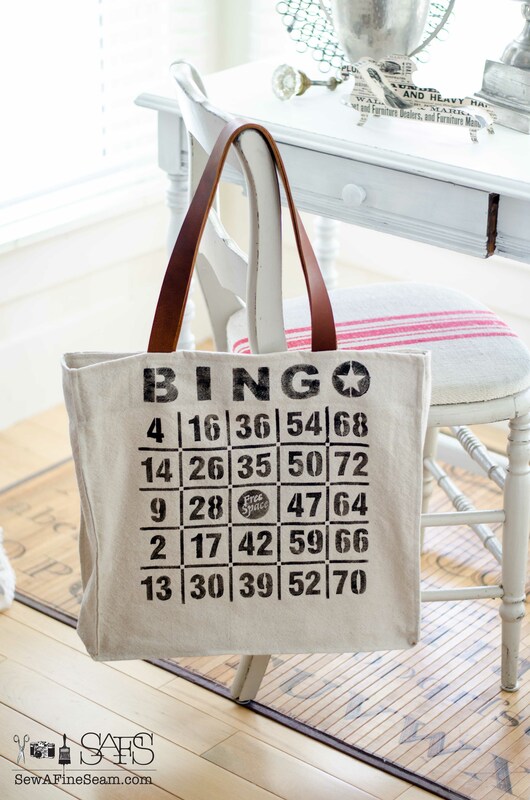 Because I love that Bingo stencil so much I added it to my handbag too. 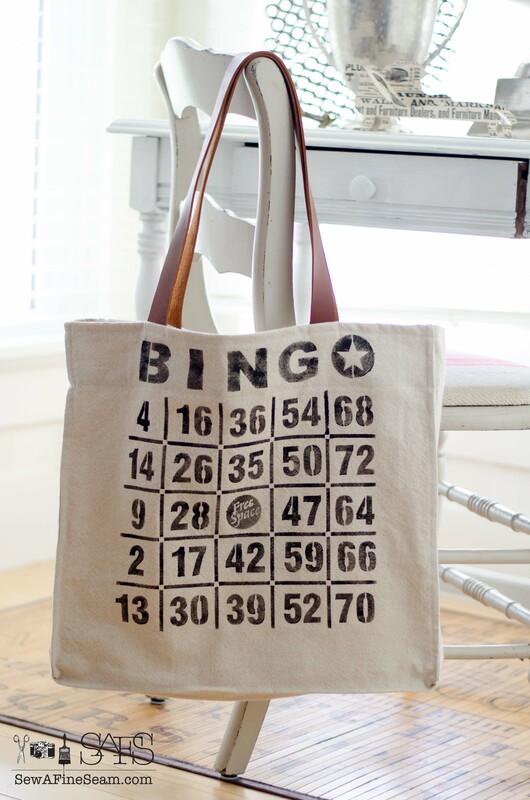 The Bingo Bag can be found in the Shop! These handbags have genuine leather handles and are made of canvas fabric. 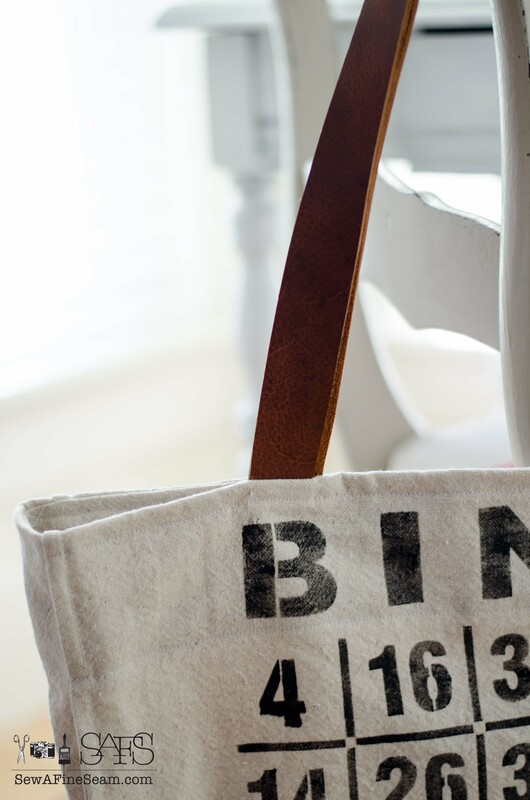 Generously sized at 18″ wide by 16″ high by 4″ deep it’s the perfect bag to take your books to the library, or snacks and towels to the pool or beach. It’s tough and can take a beating 🙂 Spot cleaning recommended due to the genuine leather handles. I’ve found this canvas is wonderful at not showing spots and stains. 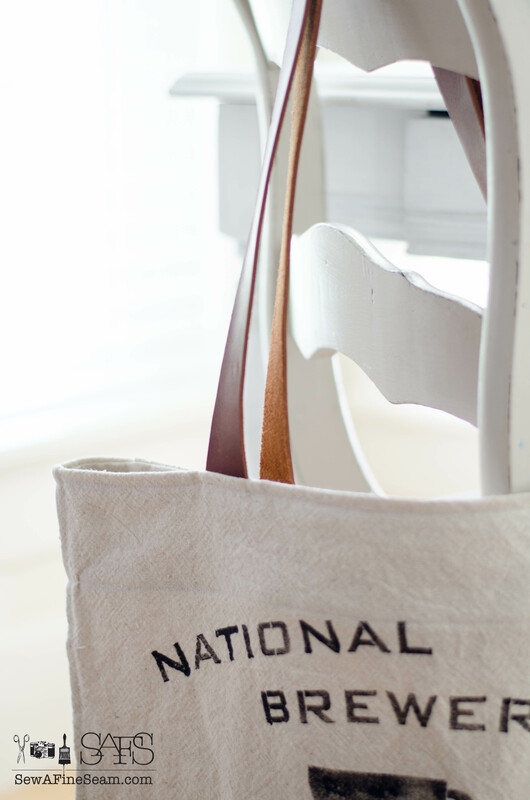 It would also be a great bag to carry on your junking/garage sailing/flea marketing trips as you could tuck a lot of small finds and goodies in here! Fabric pocket added to the back of the Bingo Bag. Another cool Old Sign Stencil – the Coffee Roasters Stencil also got adapted into a handbag design. 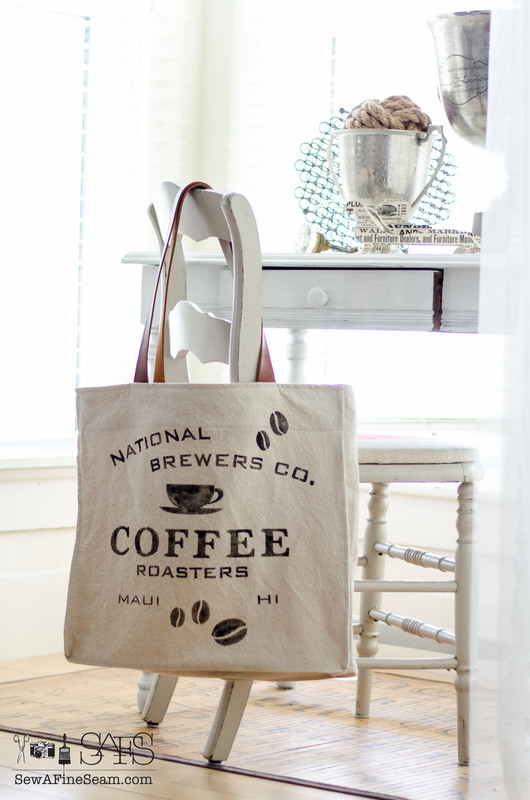 If you love coffee you will love carrying your stuff in this bag! 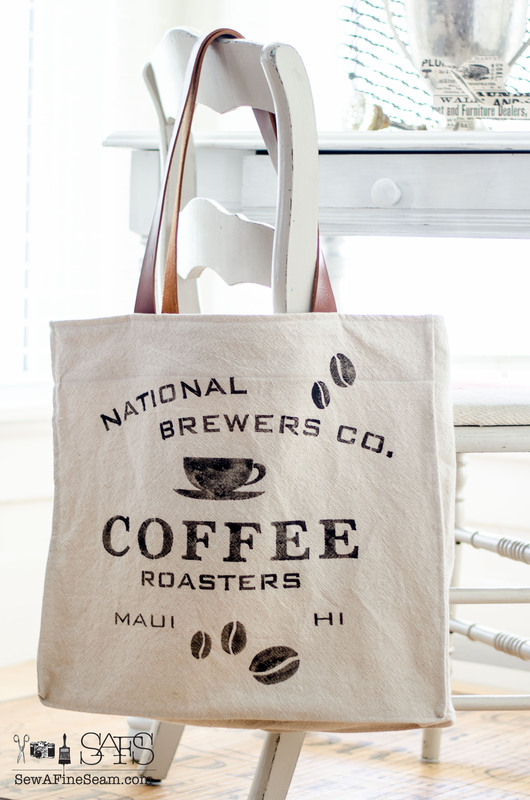 The Coffee Bag is in the Shop! I love these leather handles so much. I have some one-of-a-kind bags made too – using vintage handkerchiefs and doily’s to detail the outsides of the bags. You can also find this new design in my shop! 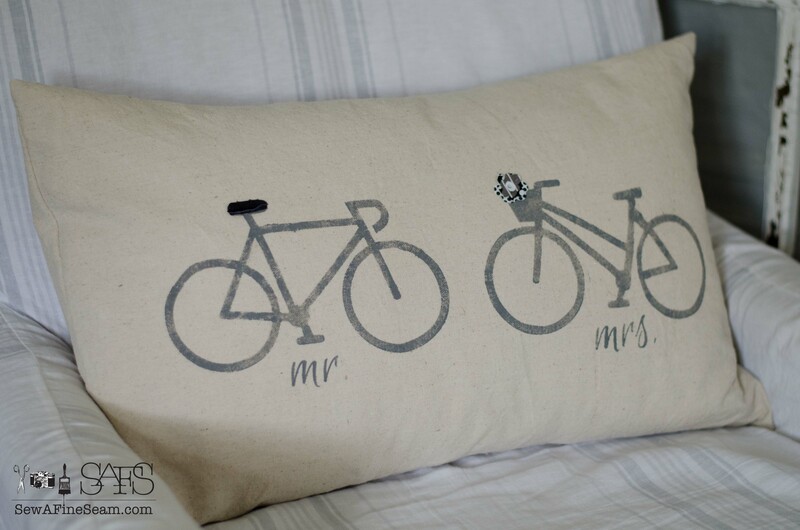 I created this Mr. and Mrs. with his and hers bikes myself. 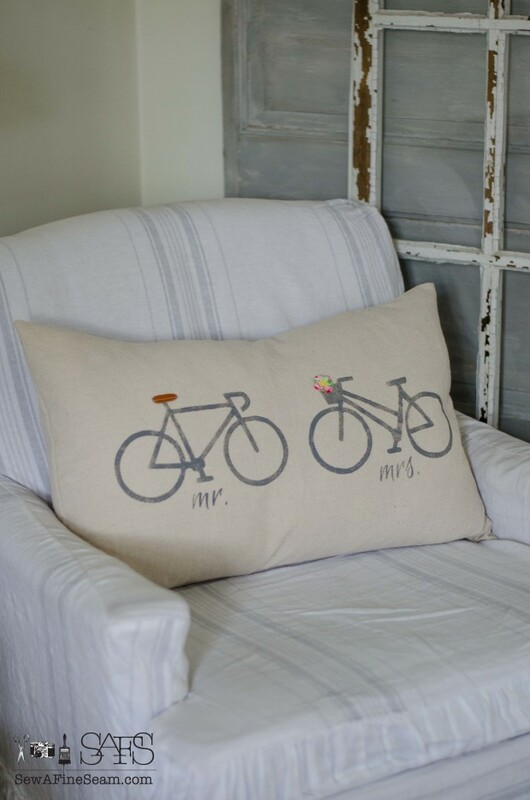 I added a leather seat to ‘his’ bike and a fabric flower to ‘hers. I love how those little details make them unique and fun. 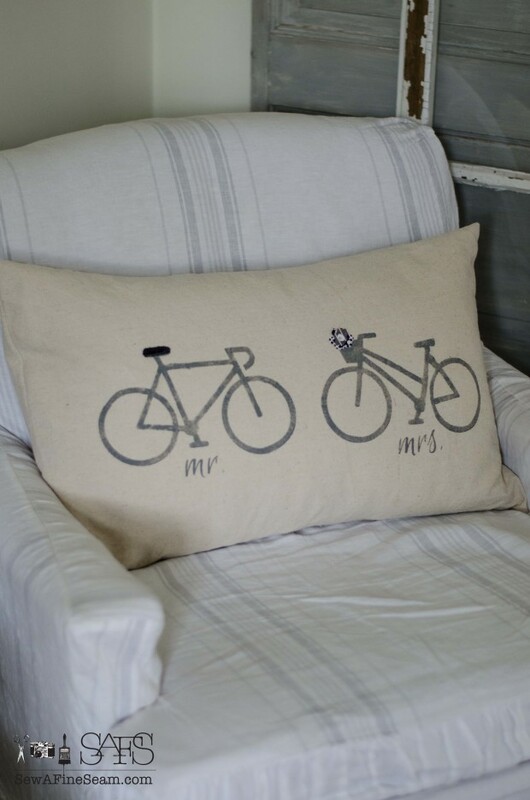 You can get this pillow design in ‘color’ or ‘monochrome’. 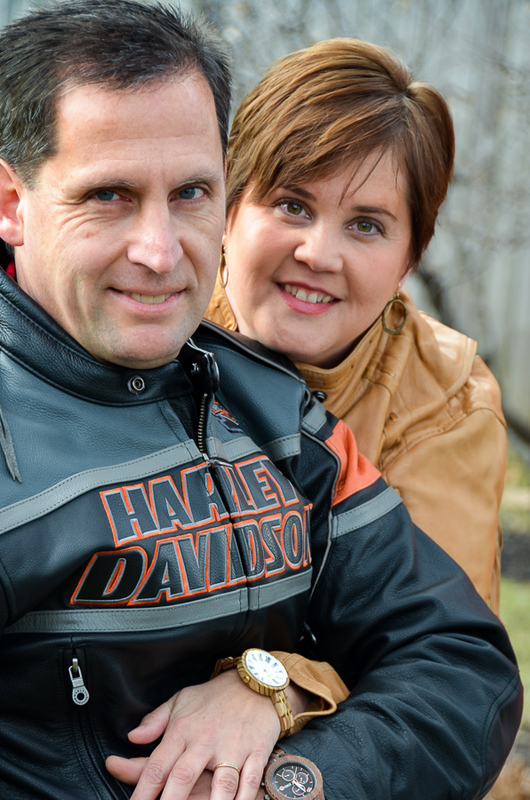 Color gives you a bright colored flower in her basket and a brown leather seat on his bike. Monochrome gives him a black leather seat and her a flower in black and white. Both of these sold at The HobNob Market but are listed in the Shop and can be made within 2 weeks of ordering. And that’s the update from The Shop! I love the Bingo pillow! Orange would be so cute for my basement. 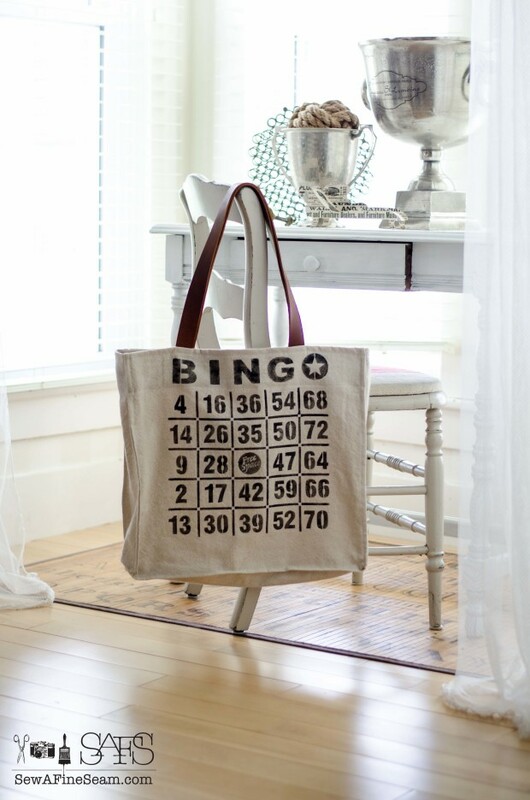 The Bingo bag would make a super fun game carrying bag. 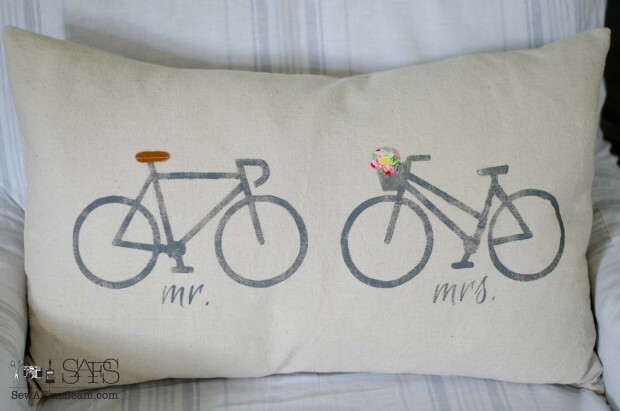 I like the color bicycle pillow so, so well too! Such fun stuff! I love your new designs! That bingo pillow is so cute and I really love the bike pillows with his and her bikes. I really like your new “stuff.” You keep going girl!!! Wow Jill, You’re getting more uptown than ever, can really see the updates you’ve done on your blog. The whole idea/your writing is more sophisticated, loving it for your sake, is it also helping sell more of your awesome products? Hope so. Glad to hear you all went on a real vacation, hope you all enjoyed yourselves bunches. Look forward to hearing about it. 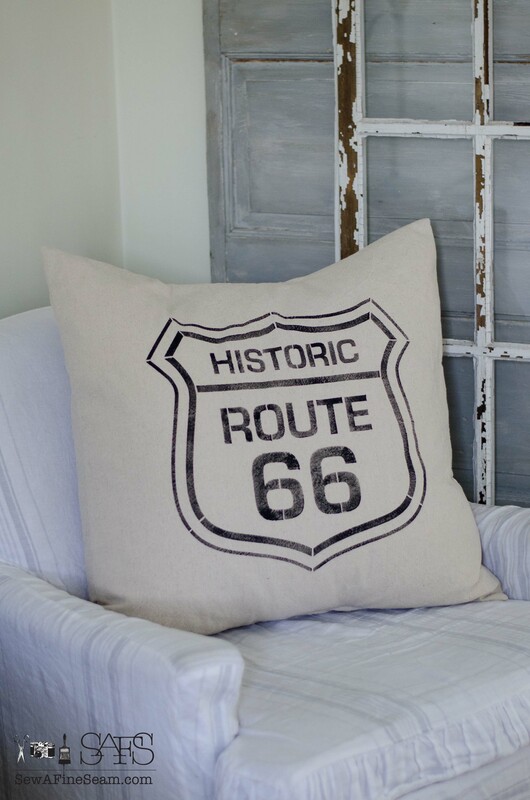 I especially love Route 66 pillow, will go with my maps theme (until I Get tired of it). Time to give my gallery wall some updating for upcoming season. It’s been raining here for almost 3 weeks, gets cooler at night. Today is first day no rain yet, but day not over with. Have had to put laundry in dryer which I’m not real happy about at any time. Hubs is doing so well with his new partial knee, scar all healed, no more pain pills, cruising all over with out walker or cane, just been 3 weeks yesterday and you’d never know he had any surgery, is back driving again also, put new ceiling fan up in mudroom last Thursday, mowed yards with ride on mower on Friday. With all the rain we had a lush jungle in back yard especially, chickens loved it. We got new ceiling fan for mudroom last Wed. at Goodwill for less than $10, what a deal. Was right size 36″ and all, was brand new still in box. Our old one flew a paddle at me few weeks ago, broke up. I’m glad it didn’t hit me. Been busy times, our grand daughter graduated from high school last Tuesday. We didn’t go to actual graduation as it was at stadium in Grand Junction, lots of walking and having to climb bleachers so thought we’d better give it a pass, hated to but had to be sensible for hubs. We did go to Baccalaureate on Monday night. She’ll be going to college at school in San Rafael, CA, beautiful campus. So this summer she’s working all she can to save money for school and having some fun there. She had straight A’s all thru high school,not easy classes either. Have great rest of week and weekend. Til next time, love all your new pillows and purses. Your bags and pillows are fantastic! I would love for you to link up to the Stitch It, Blog It, Share It Link Party going on now at BehindtheSeamsSewing.com. Thank you Susan! 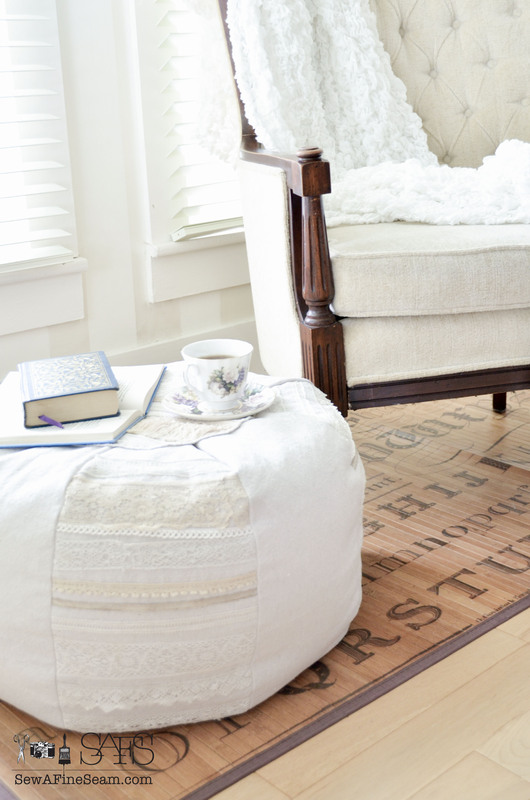 I love those stencils so much! Donna created some really great ones!